In continuing her stellar trajectory as an award-winning songwriter and vocalist (2007 — Toronto Independent Music Award for World Music Artist of the Year, 2008 — nominated Canadian Folk Music Awards for Best World Music Solo, 2009 — National Jazz Award for Latin Jazz Artist of the Year), Eliana Cuevas spent the past three years creating this dynamic and soulful fourth CD release. Her partnership with producer/pianist Jeremy Ledbetter, along with a great line-up of Latin and jazz musicians including George Koller and Mark Kelso, makes for an eclectic mix of styles performed with artistry and heart. The vocals are rich with new experience, the musical arrangements sophisticated and savvy. 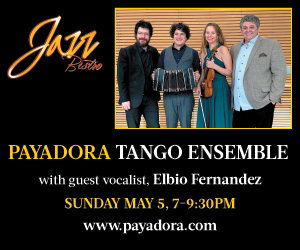 From the sultry blues/torch song Lamento to the quirky, playful and humourous El Tucusito with its traditional Venezuelan joropo rhythm performed at lightning speed, she and her collaborators move deftly through a great variety of moods and tempi. The first track Estrellita is most danceable — full of joy and exuberance — and the penultimate track, Melancolía, is the jewel in the crown, evoking a wistful yet deeply powerful longing in its portrayal of the hardships of immigration. All in all, a collection of songs fairly bursting with life and energy. I can’t wait for the live show. With the release of Momento, there can be no doubt that classical/contemporary vocalist Michael Ciufo has created a stirring and memorable debut recording. His sumptuous, baritone voice is all at once controlled, crystalline and striking, and his handsome presentation is absolutely au courant. Ciufo moves seamlessly between flawless vocals in Italian, English, French and Spanish – letting loose the poetry of each evocative phrase. Ciufo and producer Chris Bilton have assembled a literal who’s who of the Canadian music industry to perform on this impressive CD, including conductor Glenn Morley, special guest Hawksley Workman on electric guitar (enjoy his beautiful work on Oh, You Delicate Heart), George Koller on bass, Rob Piltch on guitar, Davide di Renzo on percussion, Lenny Solomon on violin, Wendy Solomon on cello, Erica Goodman on harp, Chris Bilton on piano and synthesizer programming and a host of other fine musicians. Ciufo is expert at telling the story – creating and capturing musical and/or cinematic moments. Of particular note are the melancholy Caruso, the deeply passionate Chitarra Romana, the simply gorgeous La Chanson Des Vieux Amants and the quintessentially Italian Musica Proibita. The final track, Oh, You Delicate Heart, is a country-flavoured pop song, beautifully rendered and illustrative of this skilled vocalist’s ability to impressively adapt to a wide variety of stylistic motifs. A keen romantic sensibility, deadly intonation, excellent taste, high musicality and a deeply communicative approach insure that Ciufo is well on his way to international recognition – and every bit as worthy of said recognition as other internationally successful classical/pop/contemporary vocal artists (David Foster-produced and otherwise). Flutist Ron Korb has built an international career as a studio musician and as a solo performer; he is particularly in demand for his command of any number of flutes from non-western cultures. Europa, his 16th solo CD, features him not only as performer but also as composer. The music on each track is dedicated to a prominent European composer or compositional genre, on which it is loosely modelled. Korb’s affinity for Celtic music, evident on several of the tracks, makes this disc particularly appealing. The especially compelling example of his flair for it can be found on track four, Beckett’s Whisper, which he plays on a wooden Irish flute, really, he observed recently, a baroque flute without the typical D-sharp key. The warm expressiveness of his sound in this wistful, haunting melody has not gone unnoticed: it has recently been named a finalist in the International Acoustic Music Awards. His collaborators on the disc also deserve acknowledgment: pianist Laila Biali’s distinctive musical personality blends perfectly with Korb’s, while always adding to and supporting his work. Percussionist Larry Crowe is consistently sensitive to his relationship with the other musicians. I admired his tom-tom playing in 1759, a quasi martial tribute to that watershed year in French-English relations. Winona Zelenka, whose cello playing can fill a concert hall, adjusts her sound perfectly to the intimate scale of the occasion and provides welcome contrast to the flute. It is Korb’s unique and recognizable sound, however, that is at the heart of this recording’s appeal. In the interpretive arts, there is no substitute for life experience – although a good imagination may work for a while, ultimately only genuine, experience-driven emotion transcends the mists of time. In Charles Di Raimondo’s debut CD, not only does he display a highly trained vocal instrument of terrific scope, but he has also literally infused each song with his deeply personal engrams of a life abundantly (and no doubt passionately) lived. Co-Producers Raimondo and Glenn Morley have created an eclectic program, highlighting Raimondo’s versatility. On the opening track, Raimundo (who also contributes lyrics, music and arrangements) wraps his rich baritone around Ennio Morricone’s theme from the cinematic masterpiece Cinema Paradiso, which sets an impressively high bar for the rest of the recording. Of note is a freshly reworked rendition of the contemporary classic, Time to Say Good-bye. The rock-infused production, pleasant baritone placement and double-tracked vocals result in a sumptuous, hearty version, quite unlike any of the more familiar takes from Andrea Bocelli and Sarah Brightman. The spare, emotional Caruso (Lucio Dalla) employs gorgeous acoustic guitar work as the perfect complement to Raimondo’s intensity. Also consummately performed is E Lucevan Le Stelle (from Tosca), with another breathtaking acoustic guitar solo placed against Raimundo’s fully charged vocal. Closing out the program are two more stunners: the Italian folk-inspired Mamma (Nell ‘Eterna Melodia) and the lilting and romantic Aquella Noche en Madrid – sung in Español perfecto! This is a delightful and expertly produced recording that will no doubt be satisfying to both lovers of classical and contemporary vocal music. Although Raimondo’s debut CD may have been a while in the making, the results have been well worth the wait.